Here is a painting entitled “Meditation,” which was done in 1964 by Pyotr Mikhailov. It is from the old Leningrad Museum of the History of Religion and Atheism of the Academy of Sciences of the USSR. In it a priest contemplates Gagarin’s flight into space. What is not clear to me, however, is just what this piece of official art would have conveyed to viewers. It hardly seems like a straightforward piece of atheist propaganda, or does it? This entry was posted in Cold War, Russian and Soviet Art, Soviet and Russian Space Flight, Soviet Era 1917-1991. Bookmark the permalink. I guess for me the painting stands or falls on whether or not it convinces you that the philosophical level of a Soviet priest is such that a newspaper headline about Gagarin’s orbit–in itself an event that really poses no essential challenges to Christianity, certainly nothing that hadn’t already been done in any event by say Copernicus–could induce a crisis of faith. And I guess in that sense it seems mostly to me like a failed piece of anti-religious propaganda, a piece that ends up in self-satire by implying that it somehow believes putting a person in orbit represents some new philosophical problem for religion. You have to be kind of crude to conceive the whole set up, not to put too fine a point on it. To me, the priest is thinking over a problem of how he would explain where God is situated, since a man went into space and “did not see any God there.” Also, it shows a progress of the atheistic society, as opposed to religious thought that did not provide for any advances of science (according to the history and history philosophy textbook interpretations). I faintly remember a joke that goes somewhat like “Cosmonauts went into space – did not see any [G]od,” but I would not be sure of what exactly that was. It’s interesting also, as I found in my own research on Gagarin’s reception today, that Gagarin is now re-conceived as a secret believer who was baptized and referred to his niece Tamara as “Goddaughter” and she to him as “Godfather.” In the city of Gagarin, where he grew up, museum officials and others associated with care-taking the Gagarin cult (especially Gagarin’s niece) all emphasized his deep religious faith in their conversation with me (for which I have found little convincing evidence, by the way). It is true, however, that Gagarin did lament the destruction of the Christ the Savior Cathedral, though that was hardly a rare thing even among party members of the 1960s, for whom the movement to preserve Russian Orthodox Churches was as much a gesture toward protecting the Russian cultural heritage as it was an expression of their faith in God. And though I agree with John’s comment that this piece of art seems like a crude and blunt ideological instrument, I am always struck by how Gagarin’s flight provoked much musing over the philosophical problem of God’s existence and nature — both in the realm of Soviet anekdoty and in official propaganda. That such issues still had relevance is for me the most important point of this painting. Earlier this week I saw a link to this web article from a few months ago–the “12 best pictures of Yuri Gagarin.” They play into this in interesting ways, I think–particularly, of course the man dressed as Neptune!! I am always struck by how Gagarin’s flight provoked much musing over the philosophical problem of God’s existence and nature — both in the realm of Soviet anekdoty and in official propaganda. That such issues still had relevance is for me the most important point of this painting. Which makes the painting a kind of weirdly reversed mirror image, doesn’t it? As in, priests and those who were religious may not have been so much affected as the society that claimed to have forsaken religion. If we look at it from the standpoint, though, that atheism had held full sway in Russia for less than 50 years when this painting was made–that’s not very long, certainly not long enough to wipe out a cultural memory that’s been part of the society for centuries. – Вызвали, стало быть, батюшку и говорят: “Вы должны изречь перед своими прихожанами проповедь на тему – “Гагарин в космосе летал, никакого Бога там не видел!”. Не произнесете – из церкви библиотеку сделаем и приход распустим. И вообще – в Магадан отправим! Деваться некуда, священник ведь тоже живой человек: дом, семья, дети, – хорошо, – говорит. И вот в воскресный день, батюшка после основной проповеди и изрекает: “Возлюбленные во Иисусе Христе братья и сестры, уважаемые наши гости! Вот, говорят: Гагарин в космос летал, а Бога там не видел! А Бог Гагарина очень даже хорошо видел, и представляете, даже благословил его!” In the light of the joke, the caption to picture could sound like “The priest is meditating the sermon that would glorify Gagarin’s flight into space.” To me, this painting is not necessarily a piece of atheist propaganda, but more of an evidence of the pretense on universality of the Soviet ideology. Whatever happens in the Soviet State, including the flight into space has universal significance, and even religious doctrine has to be altered to accommodate this technological leap of mankind. The anekdot is also evidence of the party control over religious service, so the priest is meditating over the ideological materials supplied by the party – the “third way” between religion and communist atheism. Of course, the picture shows a priest who is not as quick-witted as some (see for example http://igion1.ucoz.ru/news/gagarin_i_pravoslavie/2011-04-11-3), yet it looks like he may find his third way. Ingenious: that part about how the painting communicates (primarily) the universal meaning of Soviet achievement seems perfect. Thanks, Svetlana! That does make a great deal more sense. While discussing this with one of my colleagues we thought that it is also an interesting example of a combination of realism and allegory. The priest in the picture is sitting in somewhat of a monastic cell, with the light coming out of the window, and wearing what one would associate with a monk. 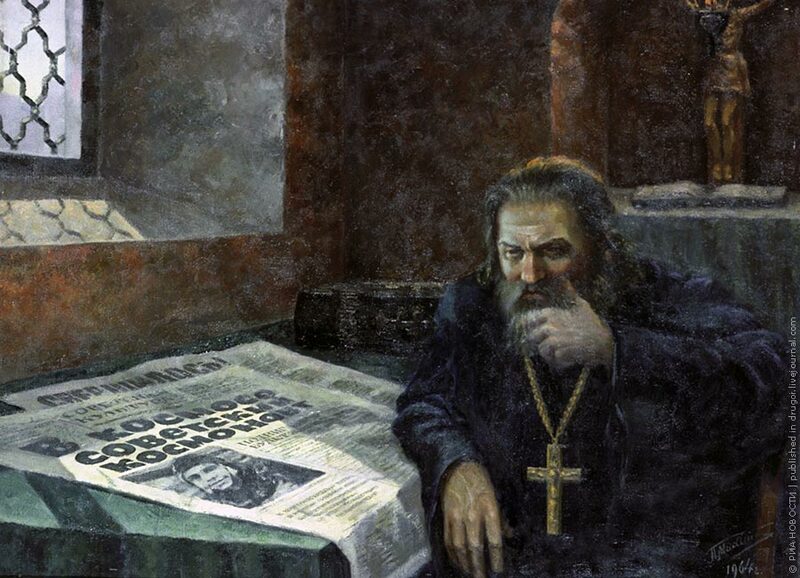 He is more of an allegorical figure than a realistic portrayal, as in the latter we might imagine a priest in the 1960s Soviet Union in his communal apartment or a village house and dressed in regular clothes, rather than a monastic robe. Newspaper with the message of Gagarin’s flight, on the other hand, is intensely real, the only element of modernity (and technology) in his “cell,” almost a vehicle of modernization for the anti-scientific institute of religion. I guess at this stage more information about the painter would help – was he painting it tongue-in-cheek, or was he “a true believer”?